No one can deny the wonders of roast beef. Just imagine the tender slab of juicy, red meat, sliced and coated with mustard. If it’s created properly, it could be no less than tempting to eat, especially imagining those succulent slivers of meat. To create a great sandwich, the ingredients must come from a trusted store, like Schnucks. They offer the freshest cuts of beef at friendly prices. One thing to remember when preparing this snack is that the part to use for a cold sandwich is different from the cut to use if it’s going to be served hot. If it will be served cold, there should be very little fat because it solidifies and creates greasy and unpleasant white veins, which is not what people look for in the deli versions they like. On the other hand, marbled fat is delicious if the whole thing will be served hot because the fat will melt on the meat and the bread, enriching the flavor of the food. 2 cloves of garlic, grated, 2 teaspoons of rosemary leaves, 2 ½ teaspoons salt, 2 ½ pounds of boneless top loin, 2 teaspoons of black pepper, and olive oil. Mix the garlic, pepper, salt, and rosemary in a small bowl. This will create a paste that will be used to spread all over the meat. Using a plastic wrap, loosely cover the beef. Place it in the refrigerator overnight or at least three hours before you cook it. Once it has been properly marinated, leave it sitting in room temperature for about an hour (or at least 30 minutes). A wire rack should be placed in a baking sheet. The oven should be heated to 325 degrees. Lightly coat the roast with olive oil. Afterwards, place it on the wire rack in the oven. The roasting time could be anything in between 75 to 95 minutes. For medium rare, insert an instant thermometer into the meat, and it should register between 125 to 130 degrees. Put it on the chopping board and let it cool thoroughly before carving. Better to use an electric cutter to get the perfect, thin slices. Ensure that it’s completely cool before returning it to the refrigerator. 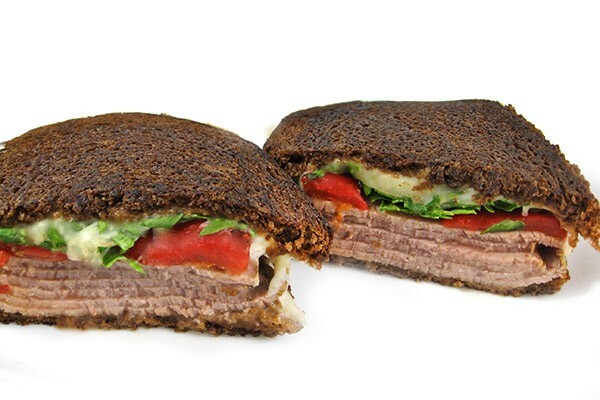 Using your excellent roast beef, create a sandwich by adding lettuce, onions, mustard, tomatoes, and Swiss cheese, with everything pressed in between white bread.